There is a family, the Davis’, for whom I feel like this, this morning. It is for those left on earth, especially one, who the angels are so very sad for, this morning. One young man is wrapped in heavenly arms, against the sadness that would crush almost any living soul. Comfort in a time of deep sorrow and remorse to these humble, quiet people. I wish I could take all of their pain away. Sadly, I cannot. On Friday, Feb 28th, as we were celebrating my oldest son’s 13th birthday; and thereby becoming a teenager, another family, intertwined with my own in quite amazingly ways, was being crushed under a burden so great, that my mind has had difficulty coming to terms with it. Two young men, ages 24 and 26, traveling down the road on a Friday evening. Who knows what was on their minds ?, what plans they had for the evening ? Who knows what actually went wrong ? It was still daylight, only 5pm. But the car left the road and struck a tree. The 26 yr old, Daniel, was thrown from the car; and was pronounced dead, at the scene. The 24 yr old, his brother Eric who was driving, suffered only “minor” physical injuries and refused medical attention. But at the soul level, oh, at the soul level, what injuries – this is hard, very hard for that young man to bear. It is a cross that he is likely to carry his entire life. One wonders at the soul contracts that brought this to pass. The 26 yr old, Daniel Wayne Davis, had only just celebrated that birthday, 5 days earlier. He had a young son. That boy who’s physical incarnation is now ended; and for whom, there are no more physical difficulties in this world, was 4 mos old and in his father’s arms – at my husband’s and my wedding, in June 1988. This man, Dale Davis, his wife Bobbi, his brother Danny and his best friend Tim Inman, along with this baby boy also named Daniel, were leaning on the large rock that is my altar, at that sacred place, the pool that we swim in during the summer time, that my in-laws camped at when they first arrived here. I see them now, in my mind’s eye. None of us could have known then, what has happened now. My husband and I were the only non-family members at this man and his wife’s wedding, just as they were the only non-family members at ours. It is not that we have been “close”, all these years since. We were their employers. They worked for us – the 3 young men, back when I first came here; and my husband had a woodworking, furniture making shop, in a 100 yr old wooden plank and very primitive cabin. My husband had created a trail through the forest, for this young man’s father, Dale, to come to work via, on his all-terrain vehicle. I remember his father as a quiet, humble man. I remember the family as always struggling in poverty, and managing the best that they could. I remember that they have always worked, mostly doing the physical kinds of labor that keep our world manifesting Life, in the manner it does. After he married, he brought his young wife, Bobbi, with him for a few days, to pick-up Walnuts from the trees around the shop, while he worked, in order to supplement their income. Our family tried to assist her in getting her GED; after she had a baby, pregnant even before marriage or graduating from high school. And then, had a second son Eric, and a daughter, April. Then, their marriage ended at some point after that. We were no longer seeing them regularly, by that time. The paths of our lives, that had us walking alongside – diverged and we went our separate ways. Until this last weekend, when their private tragedy, caused them to come flooding back into our memories. But I remember visiting them one night, 25 long years ago, in a very old ramshackle farmhouse, owned by a wealthy farmer in our community, near the town of Marquand. They had convinced the farmer to let them live there, though it was hardly fit for habitation. The young men, who worked for us, had stupidly taken two baby raccoons, from their mother. I did not realize then, that the wildness of a raccoon makes it vicious; and reached out to touch it, because it was so very “cute”. Luckily, I was not bitten. We brought one of the two babies home with us, hoping to “save” it. For a long time, it lived on our backporch; and we brought it wild plums to teach it a bit about wild foods, and fed it cat food to supplement it’s diet. It had a collar and a long chain. It would climb up the porch supports to watch the sun go down, from the roof of our farmhouse, at the end of the day. We intended to release it, before winter came, once it had all it’s adult teeth. But one day, we came home and it had made it’s escape, with that collar still around its neck; and then, we worried about that, too. Raccoons come to visit us every summer still. For many years, decades now. A mother brings 2 or 3 babies with her to eat the leftovers of our 3 backporch kitties; and at summer’s end, they quit coming and I often wonder if these are the descendants of that raccoon we once rescued. I have wandered so readily off from the pain – seeking escape from the pain I feel, in the comfort of more pleasant memories. My daughter, Misha, was my maid of honor. She knew these young men as our employees. She even went horseback riding here in Missouri, with Tim Inman, the best friend of this young man’s father, who also worked for us. Today, she shared with me these thoughts – “Being compassionate is the result of trying to understand how another must feel and it is difficult to do this without sharing that pain.” So profound and true. It is as though it crushes so heavily – that others must bear a portion of it; or it would simply be too much, it is too much – even with others taking a portion of the load. Last night, I stopped there where we were married, as I do each evening, to offer up my prayers for the day. Mostly, simply to be grateful for my day. Nothing to ask for, just grateful to have the safe security of this forest to wander about in. I prayed for Divine Love Healing Energy to surround this Davis family. I prayed mostly for the son, Eric, who was driving the car. I prayed for angels to come and wrap him in comfort and soothe him, so that he can bear what is now his to bear throughout this lifetime. 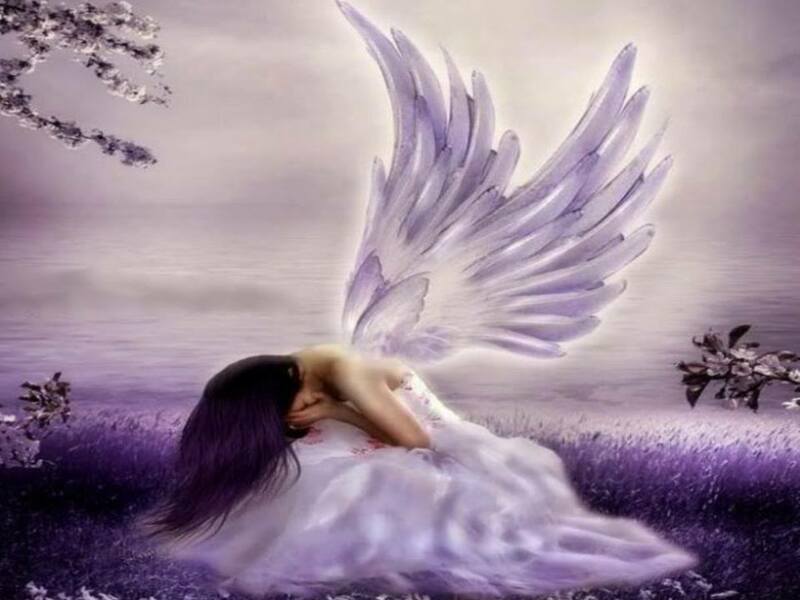 And then, this morning, my friend Amy, sent her Angel (the image above) to me, to release some of that pain, through me, for this family.